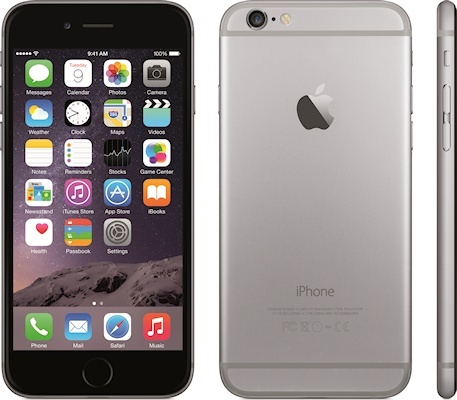 The Apple iPhone 6 and iPhone 6 Plus are Apple's latest generation of their iconic and influential smartphone line, only this time they take a break from the past and are much bigger devices. The Apple iPhone 6 has a 4.7" 750 x 1334 pixel display, the larger Apple iPhone 6 Plus comes with a 5.5" 1080 x 1920 pixel screen which is roughly the same thing that most of the competition have. Apps are meant to scale up to use the new screen resolutions, although really they would benefit from an overhaul from the developers if there are problems. The iPhone 6 Plus also fully supports landscape mode (something that is patchy on Android devices) which opens up a whole new set of possibilities. Or problems, depending on your point of view. On the back of these is an 8 megapixel camera which is a bit humdrum these days, however Apple have now added optical image stabilisation (OIS) which Nokia have proved can really improve picture quality. Both models can record 1080p video at 60 frames per second, with a maximum frame capture rate of 240 fps. The front camera has also been improved in order to create better selfies, and it now includes a burst mode. Physically, the iPhone 6 and iPhone 6 Plus are curved around the edges a bit like the early iPhones, but with design hints of the newer iPhones too. The design is unmistakably Apple, but it has evolved slightly to give the devices a fresher look. Underneath (as far as we can tell) the two devices are almost identical apart from the battery size. One new feature is Apple Pay - Apple's take on a mobile contactless payment system. This uses the iPhone 6's built-in NFC capabilities, but Apple have combined with "Touch ID" which uses the built-in fingerprint scanner to verify the user, and have also added a chipset called "Secure Element" to keep your financial data encrypted. This sort of mobile payment system has been struggling to get a foothold, but Apple have several key retailers on board in the US (where the system will launch) and perhaps this is the push it needs. Underneath, both these iPhones are now 64-bit devices, running on the new Apple A8 processor. There's also a new motion coprocessor, the M8, which helps to take the load off the main CPU. The operating system has also been upgraded to iOS 8 which should run apps faster, with an emphasis on gaming abilities using a new iOS technology called "With Metal". 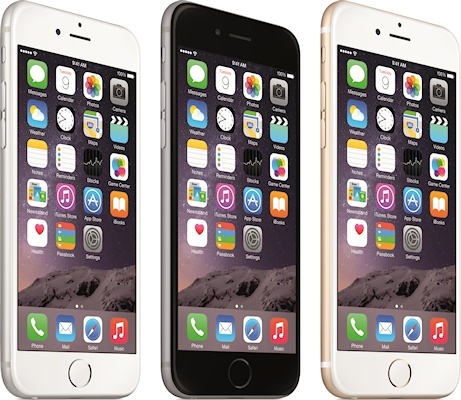 The iPhone 6 comes with 16GB, 64GB or an impressive 128GB of onboard storage. Apple say that the battery life is better (which in part will be because the battery can be bigger) with a 25% improvement with the iPhone 6 and a whopping 100% improvement with the iPhone 6 Plus. 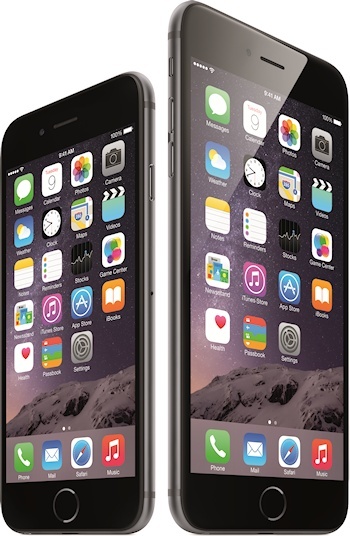 Even with the longer battery life, the iPhone 6 comes in at just 6.9mm thick and the 6 Plus is 7.1mm. It is clear that these two devices are an enormous improvement over the lacklustre iPhone 5S and iPhone 5C. The relatively small screen sizes of those earlier iPhones was giving the competition a significant advantage, but now the iPhone should have a greater appeal. But perhaps it would have been better if the iPhone 6 had been launched last year instead of the warmed-over iPhone 5 models. Both devices will start to ship from September 19th onwards in the US, UK, Canada, Australia, Germany, France and some other countries. In the US, the base model is the 16GB iPhone 6 at $199 when taken with a new two-year contract, the most expensive is the 128GB iPhone 6 Plus which is $399 with the new contract. The price differential between the Plus and the smaller iPhone 6 is $100, as is each step-up of storage. Apple say that they are aiming for these phones to be available in 115 countries by the end of the year. Available colours are gold, silver and space gray.